← [Bank] New rooms and extensions at the architect! Greetings mercs! Here we are one month after our last patch with an update rich in changes and novelties. We think it will mark a turning point: there will be a before and an after to the “Counterspell” patch! This version makes the learning process easier and more accessible to new players, and also offers better objectives that will allow even the older players to keep progressing. Items and runes have been heavily modified: they have been merged with spells which implies important changes in their effects, but also in the way the shop and the mercs’ upgrading work. We have taken a close look at your Collection and implemented new possibilities to collect spells and mercs. Throughout the coming days, we will progressively update guides and tips so that they remain relevant to in-game content. The last update, which took place on the 9th August and concerned Community and Gameplay Depth, didn’t have its own patch notes so we incorporated the unreported improvements into this one. These improvements will be annotated with the mention “Unreported”. We cannot wait to hear your reactions! See you very soon in the Collapsed Realms! NEW CHESTS & GOLD – There has been quite a change in your collection! Spells can no longer be purchased individually in the shop, but in chests also containing Mercs. You can obtain these chests at the end of a game, as a quest reward or in the shop. When you get a Loot Chest (end of a game) or a Heavy Chest (quest reward), it appears on the homepage map. To open it, you will need the help of one of your Mercs. Assign him to his mission and wait until he reaches his destination! The implementation of chests has lead us to reevaluate the amount of Gold won upon leveling up your account. You win more Gold than before when you are at a high level, but slightly less at starting levels. The same logic has been applied to the amount of Gold won through victories, which are significantly more lucrative when you also receive a chest (approx. 260 Gold). NEW ONGOING QUESTS – We added a new feature on top of the events: the quests! Access every day to a different quest, which will grant you Gold and Heavy Chests if you manage to achieve the required objectives. Unlike events, there is no time limit to complete these challenges and you can even swap one for another once a day. You can cumulate up to 3 quests at the same time. UNREPORTED MATCH TV – The replay feature is finally here! Want to learn new ways of playing from the the top of the ranking? Show your friends your latest pro moves in the arena, or simply relax in front of a game? The TV is there to please! Select and watch the match you’re interested in from the list of played games. The replay features different viewing tools such as pausing and fast-forwarding, and allows you to follow, one turn at a time, the players’ tactical choices by also displaying their spells. Games recorded from a previous version are not viewable, but still appear in the list. NEW UPGRADES – Until today, every mercenary used to upgrade from level 1 to 10 during the game, based on the accumulated experience. Each new level would increase their Attack, Health and Speed. From now on, the leveling up will happen outside the game, with a subtlety nonetheless: upgrading a mercenary outside the game determines the max. level he can reach during a game. For instance, if you possess Skara and upgrade her to level 5, you will enter the game with a level 1 Skara, who will then progress towards level 5, while your other mercenaries stay at level 1. To rise the maximum level of a mercenary, you need to collect copies of mercenary cards and pay a certain amount of Gold. Gold can be obtained by playing games, achieving quests or opening chests. DELETED EXPERIENCE – Mercs no longer level up in the course of a game by accumulating experience. NEW PURCHASING LEVELS – The in-game levels of your mercs can be bought in the same way as spells, in the shop. Starting at a low price, they progressively become more expansive as the level rises. When a mercenary hits another one at high speed, it is quite natural that he deals more damage than he would at lower speed. The shock is violent, so its consequences should be too. We thought about several ways to incorporate this effect, such as the Critical Hit: upon using a booster, a mercenary deals twice or three times as much damage colliding with an opponent. That way various movements are made possible and you have already shown us great combos using this feature. But we intend to take an extra step by introducing a new stat: the Impact Force. NEW IMPACT FORCE – It is a damage bonus added on top of Attack. The faster a mercenary moves when he collides with another one, the greater the bonus damage. Our guides and info pop-ups show the mercs’ max. damage bonus, which is reached when thrown at full speed. We will improve the visual aspect of the impact later on, in order to strengthen the feeling of violent shocks. NEW BALANCING – Those who are particularly attentive to the amount of damage dealt or health points restored will notice that all the values have been modified. We decided to start from scratch to increase the scale of values and correctly implement the Impact Force. A greater flexibility for a greater precision! The entirety of these changes will not be explained in detail, as these patch notes are already long enough, but we will keep you posted about nerfs and ups in the following ones. One of Skara’s strengths is her ability to weaken and separate the opponent from his team. It is her way of setting up team fights: for this reason, the weakening shouldn’t punish enemy risk taking in the jungle but allow to control the mercs’ abilities. Consequently, the function of War Banner has been better defined and now focuses above all on cleansing ability effects. UNREPORTED WAR BANNER – War Banner no longer cleanses buffs granted by the jungle or gates. It cleanses the following effects: Aether’s Mental Control and Binding Shackles, Sylden’s Noxious Cloud, Kaûro’s Cold-blooded Channeling and Esotrod’s Vanguard. As long as the target is under the banner’s spell, it cannot benefit from these effects. UNREPORTED COLD-BLOODED CHANNELING – Kaûro’s shield can absorb up to 4 hits and only lasts 2 rounds. The damage absorbed during Cold-blooded Channeling is stacked for Surgical Strike’s damage. If Kaûro receives a fifth hit, his shield breaks and the stacked damage is lost. UNREPORTED SURGICAL STRIKE – Performs as many hits as those absorbed by Cold-blooded Channeling’s shield. Each hit deals damage equal to a percentage of those received during Cold-blooded Channeling (1st hit = 10%, 2nd = 20%, 3rd = 30% and 4th = 40%). Surgical Strike cannot be activated if Kaûro didn’t receive any damage during Cold-blooded Channeling. Attacking unseen opponents is not supposed to be one of Orbital’s skills. It’s his allies’ job to provide him with vision so he can use his shards optimally. UNREPORTED VISION ON ENEMIES – If an enemy is hidden by the fog of war or in a bush, Orbital no longer detects him and thus doesn’t throw his shards at him. This applies to Scattering Shards and Sharped Crystals. When Kooky submits a jungle monster to her will, she orders it to attack a nearby enemy building. But the spectral minion has a limited lifespan and a long distance to travel. Consequently, the minion sometimes happens to die before reaching the targeted Tower or Gate. In order to respect that logic, we adjusted the minions’ attack priorities. UNREPORTED ATTACK PRIORITY – The spectral minions created by Kooky attack the building that is the closest to the jungle camp they spawn from. Of course, they can attack Gates only if the Towers have already been destroyed. Items and runes merge with spells into one single entity. This merger is at the root of the complete reshaping of your collection. From now on you can unlock and collect no less than nine spells, to which we will add new ones in the course of the updates. These spells can also be upgraded. By collecting a certain amount of copies and spending a sum of Gold, it will be possible to level them up. And a higher level means more power as well as additional effects! Spells have four levels of rarity: Common, Rare, Epic and Legendary. NEW TELEPORTATION – So far teleportation was an ability accessible to every mercenary. Its strategic potential is huge but we don’t want it to be systematically used, the risk being extended games. That is the reason why we keep teleportation, but only as a spell, which grants one teleportation to a chosen mercenary from your team. Upgrading the spell increases the number of mercs benefiting from it. NEW CHAIN LIGHTNING – Allied mercs are linked to each other by a lightning that sends an electrical shock to crossing enemies. Damage dealt by the shock increases at each spell upgrade. NEW RESURRECTION – This spell allows a dead mercenary to instantly revive. Upgrading the spell increases the number of allowed resurrections. NEW RAMPART – The Rampart spell grants a one HP shield to your Towers. Upgrading the spell increases the shield’s power and allows Gates as well as the Core to benefit from it. NEW PIERCING HIT – A chosen allied mercenary is provided with a piercing hit, that’s to say a double hit on buildings. Upgrading the spell increases the number of mercs benefiting from it. NEW MISSILES – This spell replaces the standard building attacks with missiles. Upgrading the spell increases the number of missiles fired. NEW HEAL – Instantly heals the whole team by 44% of max. HP. Each upgrade increases the spell’s effectiveness. NEW CAMOUFLAGE – Allied mercs conceal their identity to the opponent, who can only see a question mark. At higher levels, other elements become hidden. At the last upgrade, your mercs swap identities to confuse the opponent. NEW ENERGY RECOVERY – A chosen allied mercenary is provided with an additional movement. Upgrading the spell increases the number of mercs benefiting from it. So far, the shop has been an ongoing issue: it was masking the action taking place in the background and didn’t allow to effectively compare one’s purchases with those of the opponent. It has been frequently reported in your feedbacks, which lead us to change the concept drastically. No more Keys or Stars! From now on you only earn Mana, through the usual means (eliminating a mercenary, destroying a building, etc.). The shop is constantly accessible and you can spend your Mana there during the opponent’s round, so that your Spells are enabled at the following one. You can view the opponent’s Spells at all times. DELETED FIRST ROUND APPEARANCE – The fog of war disappears from the early game. Instead it becomes one of the Octopus’ powers. Read the changes to the Octopus to learn more about it! NEW OCTOPUS FAMILY – The family gets bigger! Since we merged items, runes and spells, we also had to take a look at the octopus’ role and how to make it more game changing. We want to give teams ways of catching up if they didn’t manage to take it down, and other opportunities to turn things around and speed up the game. From now on there will be three Octopuses spawning during the game, each of them providing different rewards. NEW TENTACULAR OCTOPUS – The first octopus remains unchanged, it’s the Tentacular Octopus. Purple-skinned, it still appears at the 6th round and transforms the mercenary killing it, granting him a piercing hit, an additional move and improved stats. NEW INKING OCTOPUS – The second octopus is the Inking Octopus. Green-skinned, it appears at the 11th round and the team who kills it spreads a fog of war over its opponents. This affects their vision while the other team keeps a complete sight of what happens in the Collapsed Realms. The fog remains until the end of the game. NEW POISONOUS OCTOPUS – The third octopus is the Poisonous Octopus. It hast the same effects as the Tentacular Octopus but with way more powerful Attack, Health and Impact Force bonuses. The changes to the Octopus’ role is a starting point and we intend to bring more modifications over the next updates, based on your feedback. We will progressively implement a new way of eliminating octopuses as well as more distinct rewards for each of them. NEW ATTACK OF BUILDINGS – The attack of buildings increases gradually, at the same rate as mercs. No more final assault without blood nor tears! No matter what stage of the game you’re at, staying near a Tower or a Gate can be dangerous. 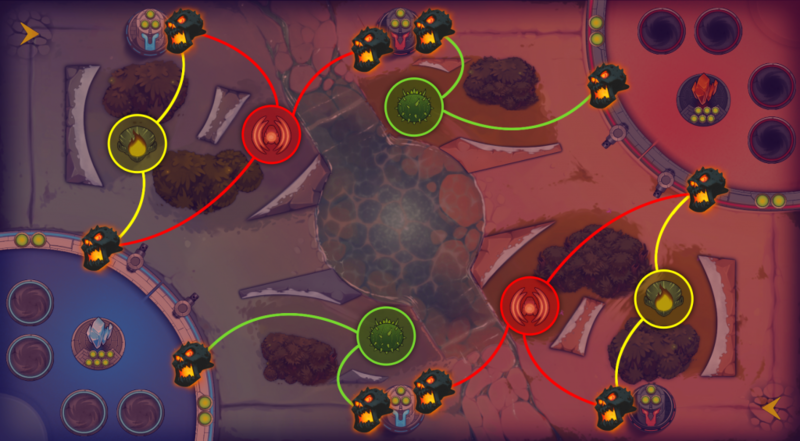 NEW JUNGLE BUFFS – Alongside buildings, jungle buffs also gain power gradually, round by round. DELETED SELECTING MERCS – Before entering a game, you used to select your team and adapt it to the opponent’s preferences. We are still unsatisfied about this phase and although we are aware of its utility, we decided for this version to remove it from the game, rather than letting it available as it is. We intend to reintegrate this feature in the coming updates, but first we need to test better, more adequate solutions internally. NEW INTERFACE – We greatly simplified the interface to enable a quick access to the essential features. Shop, Collection, News and Clan are now the five main menus. Graphics have been modified to match this new layout. UNREPORTED INTERNET ACCOUNT – You can create and modify your password on our website and play on browser. We recommend the use of Chrome for a better stability. The account of your mobile device (Android and iOS) can also be bound to your internet account. This entry was posted in BAClash, and tagged contresort, patchnote, version. Bookmark the permalink.